I still remember the day I decided that I was going to make games. It was the very same day my brothers and I finally cracked open that box and drew out our shiny new Super Nintendo, which we have been working and saving up for what seemed like an eternity (everything seems like an eternity when you’re 10). We had already enjoyed Atari and NES games for a few years (and mastered every single game we could get our grubby hands on) but as soon as we heard that Nintendo was making another console, we immediately started concocting money-making schemes. Right after reading that news in Nintendo Power, we dedicated our immediate childhood to trying to earn enough money to buy ourselves an SNES on launch day and be the first kids on our block to have one. Well, it doesn’t matter how poor you are or how old you are, hard work pays off… big time! Lemonade stand gave way to lawn mowing, gave way to painting, gave way to buying candy in bulk at Costco to be sold individually from our backpacks during school recess: reinvest, reinvest, reinvest. Not only did we earn enough money to buy a Super Nintendo (plus a few games) on release day, but we were also able to take our family to Disneyland for an entire weekend! Ya, Baby! That’s the power of a little work, every day, over time. Okay, a lot of work, actually… plus passion and a lot of plan iteration. The day we opened that shiny new box and first plopped in Super Mario World changed my life forever. I remember thinking to myself, “Wow! This looks like a cartoon! How cool!!! !” In a time when every pixel was noticeably square, that was truly a sight to behold! And not only did it LOOK great, it FELT great! It was everything that I loved about the original game and a lot more. “How cool it must be to be able to make something like this,” I thought, “I can’t wait until I grow up so I can make games!”. Hahaha, oh how foolish kids can be. Well, whatever enthusiasm I had for growing older has long since gone but the dream of making games has been ingrained deep within me ever since. learned art, programming, music and a whole mess of game related stuff… made countless prototypes and a few games for fun (for Commodore 64, Apply IIe, DOS & Windows 3.1-95)… took an 8-year break from the hobby to devote time to my family… and now I’m back at it… and now it’s not just a hobby! 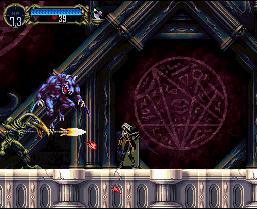 “Castlevania: Symphony of The Night” – Frigg’n Awesome! And you know what? The timing worked out pretty well! I’ve been following the gaming industry closely this entire time and yes, still plugging out a game prototype here and there. I’m overjoyed that games being made by individuals and small teams are making a comeback in a huge way. People are starting to realize that fun and innovation are just as important and cutting-edge, Hollywood movie graphics and I think that’s great! It also just so happens that both of my kids aren’t babies anymore (they aren’t making a hygienic mess of themselves anymore and are less likely to kill themselves by choking on a small toy). What’s more, they seem to really enjoy the fact that daddy makes games. They even help me brainstorm character ideas and playtest! Games take a ton of time but progress is steady and I AM HAVING A BLAST! Hello world, here I come! This entry was posted in Game Development and tagged Indie, Life, Passion. Bookmark the permalink. I’m not a video game developer, but I follow the industry closely and the things that independent developers are doing these days is incredible. It’s great to see the little guys getting more spotlight and I can’t wait to see what’s to come.